Quarterback Tyrod Taylor has had nearly three months to reflect on his trade from the Bills to the Browns. While in Buffalo, the veteran’s hold on the starting gig was tenuous, and he discussed that situation with Vic Carucci of The Buffalo News. Specifically, Taylor touched on his relationship with Bills head coach Sean McDermott. Taylor acknowledged that he expected major changes when the team first hired McDermott in 2017. He was also appreciative that the head coach and general manager Brandon Beane kept him informed about the trade that would eventually send him to Cleveland. After his breakout 2015 campaign, Taylor proved to be a reliable, turnover-limiting quarterback. While his job seemed relatively secure when he was playing for Rex Ryan, McDermott was never willing to full commit to the former sixth-rounder. 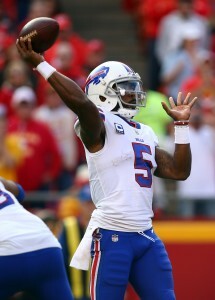 Despite being benched one game for Nathan Peterman, Taylor still put up solid numbers in 2017, completing 62.6-percent of his passes for 2,799 yards, 14 touchdowns, and four interceptions. He also compiled 427 rushing yards and four touchdowns on 84 carries. Still, while his tenure with the Bills ended unceremoniously, Taylor still has fond memories of his time with the team. He does indeed seem to have a good perspective! He is a good guy and has a cannon for an arm. Look at his college game video. But for some reason he always seemed hesitant to throw in the NFL, especially long. I think the Bills shoulda kept him and let him compete. At worst he would be one of the best #2’s in the league. He still may be one of the best #2’s in the league…. Avid Bills fan who has watched all of his games since he was on the bills. Fantastic person on and off the field, great team player, always willing to do what is necessary for the betterment of his team. Has fantastic arm strength and can throw a pretty deep ball. Also a great scrambler and runner which makes up for a poor O-Line and keeps Defenses honest. Also is great at limiting turnovers. However, his biggest flaw is his poor accuracy on short to intermediate throws, often throwing above the receiver’s heads or at their feet on slants, short outs, etc. Overall though a competent starting QB and a great guy. Sorry to see him leave but will always root for the guy. Thanks for the objective review. Bring a Browns’fan, I haven’t had a chance to see much of Taylor. I’ll watch for your areas of concern this year. I was hoping the jets would have picked him up last year or even this year to be the starter. I dont think he is a star qb but a solid qb to keep you in games but not give away the game. Bills fan here. I wish Tyrod nothing but the best in Cleveland. He always reminded me a bit of Doug Flutie. Good guy, good character, solid quarterback. He’s not what the Bills need right now, but he’s in a good spot in Cleveland.